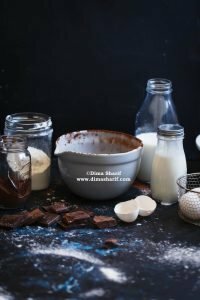 Here are some useful baking Lingo & Techniques explained to make your life easier when reading baking recipes. Ribbon stage batter : Ribbon is when you lift the beaters and a stream of the batter falls down in a steady motion forming ribbon-like lines on top of the batter in the bowl. Creme Anglaise: English cream / Custard. Dusting: Usually in reference to sprinkling a powder over a surface. The powder could be icing sugar, cocoa powder or even spices… This could also be in reference to sprinkling flour before working a dough or pouring a batter into a baking tin. Jelly Roll Sheet : is a rectangular baking sheet / cookie sheet with high edges. Usually used for baking sheet cakes (thin cakes) as well as jelly roll cakes, which are sheet cakes that have been filled with a type of frosting/filling then rolled into a log. Lined sheet/baking pan: A baking sheet or pan lined with baking paper. Soft Peaks: In reference to beating eggs, these are peaks that curl up when you remove the whisk instead of standing stiff. Stiff Peaks / Hard Peaks: In reference to beating eggs, these are peaks that stand stiff when you remove the whisk instead of curling over. Ganache: A layer of melted chocolate mixed with cream used to cover a cake (gives a glossy chocolate finish to cakes), and also used as a filling for cakes, macarons and a variety of desserts. Ganache is also often used as a binder and glue to stick some decorations on a cake or cookie. Double Boiler : The idea is to cook on steam. Therefore, the water in the bottom part of the double boiler must not touch the bottom of the top part. Heat source is the steam from the boiling water. This method is usually used in cooking delicate foods such as eggs and chocolates…etc. Custard Spoon Test: Is when the cream mixture coats the back of the spoon, creating a steady layer of cream that does not slip off the spoon. The layer should stay separated should you pass your finger down the centre. Chilled Bowls & Beaters for whisking: Using a chilled bowl and beaters when whipping cream, speeds up the whipping process and prevents the cream from separating and curdling. Folding: Mixing gently where you pull the bottom upwards and push the top to the bottom. Usually carried out in the shape and movement of 8 or S.
Sifting: Usually powders are sifted to ensure no lumps are present. For best results in baking always sift all soft powders before use in the recipe. Tempering eggs: Once the milk mixture reaches a boil, remove from heat and pour 1 ladle of the mixture into the eggs and sugar mixture while continuously whisking. This is to temper the eggs, so that you do not end up with lumps of scrambled eggs in the cream mixture.